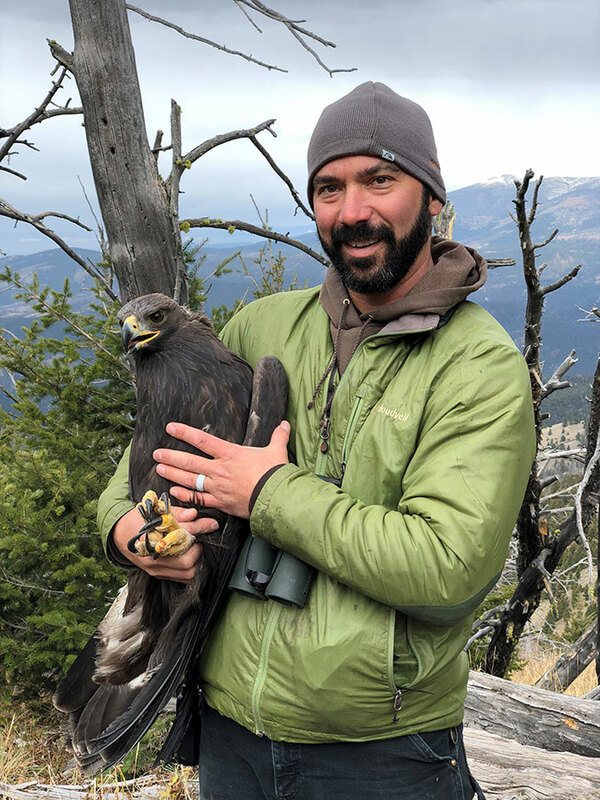 For the past fifteen years, Bryan Bedrosian has been studying the birds of the Greater Yellowstone Region and the Great Plains. Focusing on raptors, corvids (of the Crow family), and sage-grouse, he has been involved in movement studies since researchers first began using GPS to track birds. At the next Draper Natural History Museum Lunchtime Expedition lecture, Bedrosian presents Beyond Borders: Bird Migrations to, from, and through the Greater Yellowstone Ecosystem. The free talk, which includes examples drawn from data Bedrosian has collected through the years, takes place on Thursday, December 6 at 12:15 p.m. in the Buffalo Bill Center of the West’s Coe Auditorium. Bedrosian’s diverse projects have explored migration and spatial ecology, genetic studies, environmental contaminants, and bioacoustics. He currently serves as research director for the Teton Raptor Center, a research, educational, and rehabilitation non-profit based in Jackson Hole, Wyoming. An innovative researcher, Bedrosian has designed—and made available to colleagues—research tools such as remote net launchers for capturing eagles and ravens, an automated wildlife recording device, and the method currently used for GPS tracking sage-grouse. He also designed the GPS transmitters that he uses for his own studies. The Lunchtime Expedition lecture series organized by the Draper Natural History Museum and supported in part by Sage Creek Ranch and the Nancy-Carroll Draper Foundation. Bedrosian’s talk wraps up the series for 2018; after a brief hiatus, it resumes in February 2019. To learn more about the Draper Museum’s natural science programs, visit centerofthewest.org/explore/greater-yellowstone-natural-history or contact Bonnie Lawrence-Smith at [email protected] or 307-578-4020. Explore the Center’s full calendar of events at centerofthewest.org/calendar. Image: Brian Bedrosian in the field with a golden eagle. Courtesy photograph. Contact: Bonnie Smith at [email protected] or call 307-578-4020.